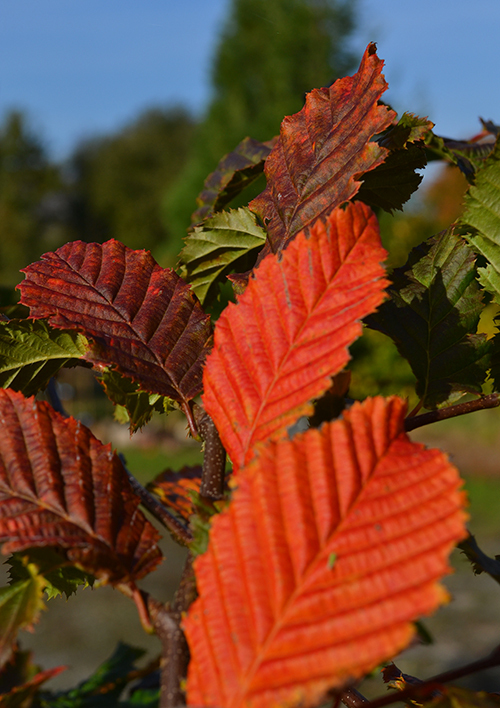 We’re pleased to announce that after an extensive 3 year trial at the European new tree varieties testing facility in Germany, the stunning autumn-colouring Hornbeam Carpinus betulus ‘Rockhampton Red’ (CBRR), has gained official Plant Breeders Rights. These have been granted to Geoff Locke who discovered this (now confirmed as unique) cultivar of the native Carpinus betulus at the nursery in Rockhampton almost 30-years ago. The CBRR’s spectacular fiery-red and orange autumn show competes with the best seasonal displays of Acer, Parrotia and Liquidambar ornamentals, whilst maintaining the hardy characteristics of common Carpinus betulus. In the last 3 years, CBRR has been displayed at most of the major European tree and plant shows. It has won several awards and was judged by a panel headed by Roy Lancaster V.M.H. to be the best in show at a prominent French horticultural show. We offer a range of specimen sizes of this now patented, unique tree.